This stand up is a beautiful Victorian Santa wearing a light red coat with an iced hood. He has a hobo sack on a stick over flowing with toys in his left hand and his right hand is holding a tree. The tree has detailed cut outs between the snow laden branches and enhanced with a snow ribbon, pink satin ribbon and gold bell. 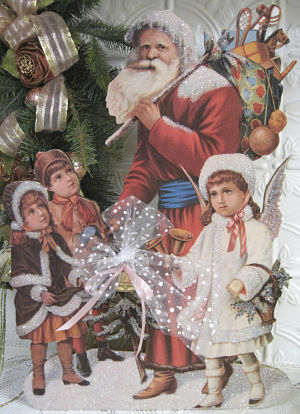 Next to Santa are a little boy and girl dressed in Victorian Style. She is wearing a caped coat in a dark brown with white fur trim and matching hat along with buttoned boots. The boy is wearing a matching coat and hat in shades of light brown,nickers, red stockings and black buttoned shoes. 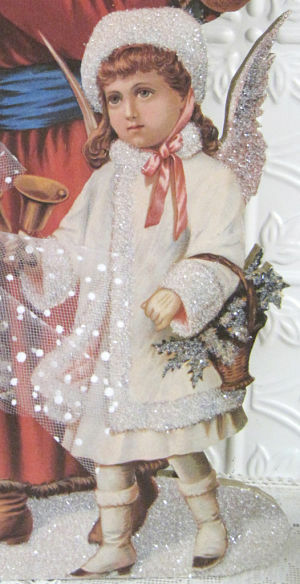 Angel is dressed in white coat with fur trim. 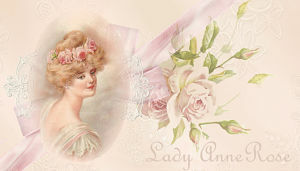 Matching hat is clasp with a pink ribbon. She has a basket of holly over her arm as she rings bells with her right hand. The piece is enhanced with crystals glitz. Beautiful piece for a table or mantle and best displayed where light can be reflected off the glitz.